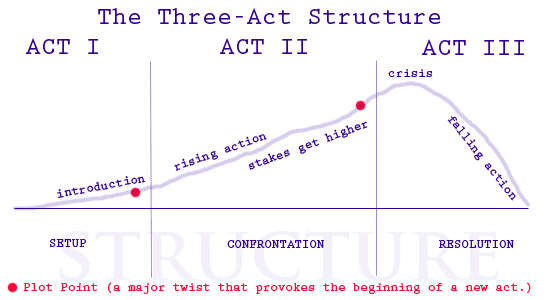 I used to hate the 3 act structure simply because that’s the formula you see in every screenwriting book. How can you create art following such a restricting structure? I’ve changed my mind since. There are a lot a great filmmakers who express their full creativity within the ‘restrictions’ of this formula. One of my favourite film directors, Rainer Werner Fassbinder, used the structure of Hollywod melodramas to create some of the best German movies I’ve seen (Fear Eats the Soul). Ozu doesn’t use the 3 act structure (and breaks a lot of filmmaking ‘rules’) and his movies are still as fresh today as they were half a decade ago. Steven Spielberg is the classic Hollywood director of our time, and he’s made more timeless classics than any other director. I just re-watched Jaws last week and wondered why nobody has made a monster movie since that has reached the same level of perfection (the only movie I can think of is ‘The Host’). So, even though I’m a little late, I’m finally studying the 3 act structure and classic screenwriting books to master this art. If only to break it later in my own works. 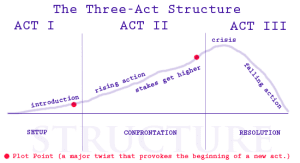 Good to see someone writing about the 3 act structure and how it isn’t really relevant. Well that’s my opinion on it anyway. I think we’re going to get to a point where more and more we see really unique pieces of entertainment written without that three act structure! Thanks for the comment, Alexandra. Glad to see you around the blog! It’s certainly already going that way, RE: 3 act structure. For the longest time, indie films (in particular) have shunned 3 act structure. Thanks for finally talking about screenwriting. Liked it! Thanks for the comment and for the kind words about the site. Been blogging here on Filmmaking Lifestyle since 2011. It started as a hobby, but has gone beyond that and is now a burgeoning business for me!